Boost your bedroom's storage with one of our fantastic triple wardrobes. All made from solid 100% hardwood with stunning drawers and finishing details. Fashion lover's delight! Our triple wardrobes offer plentiful storage and dashing good looks, keeping you and your bedroom looking your best, season after season. Our 3 door wardrobes are made from only the finest hardwood timbers using traditional carpentry methods, so you know they will be beautiful and long-lasting pieces of bedroom furniture. 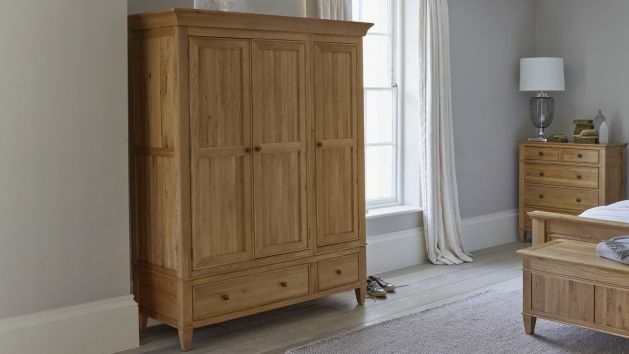 Our selection of large wardrobes includes pieces from our more than 20 ranges, so you're certain to find a style that suits your bedroom furniture. They are designed to maximise storage in your room with a triple hanging space above two spacious drawers. Each drawer is finished with real dovetail joints for added strength and durability. The hanging space also has two separated sections, perfect for those sharing a wardrobe. Browse our complete selection of solid oak, mango, painted and other hardwood triple wardrobes below.